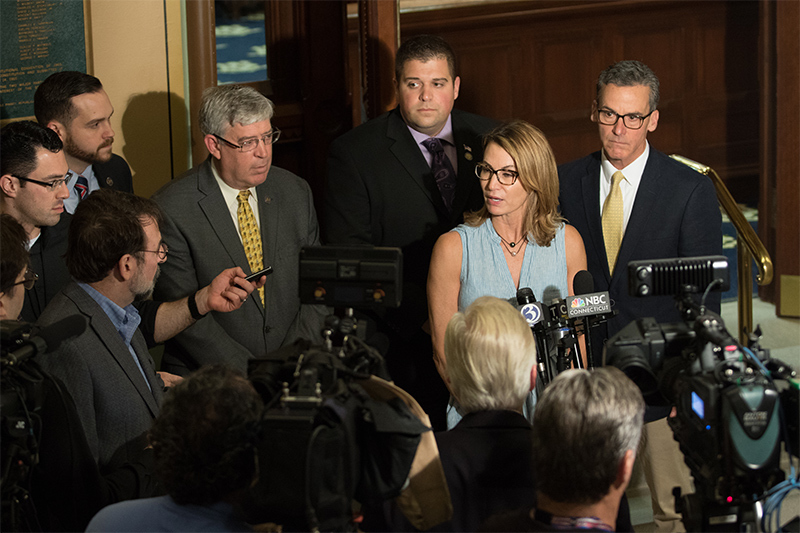 HARTFORD – House Republican Leader Themis Klarides and her colleagues this week called for an up-or-down vote Thursday in the House on the balanced, no-tax increase Republican budget – the third one her caucus has produced – noting the Democrats have failed to produce a single proposal. Republicans came up with a balanced budget this spring and then revised that proposal to account for a dramatic drop in revenues in late April. The Democrats did not even produce a plan by the time the legislative committees reached their deadlines later in the spring. The Office of Fiscal Analysis recently reviewed the third balanced House Republican budget. Klarides said the missed deadline and the prospects of a prolonged budget fight will result in huge problems for towns and cities that count on state revenue to help run local government. Those most at risk and in need of social services will also be affected. Revenue Changes: A list of every policy and current services update on the revenue side of the House Republican budget.